Join us as we take a deeper Biblical look into the difference between good and bad habits, and why not all habits our bad. In the fifth message, Pastor Paul talks about attitude. In the fourth message, Pastor Paul talks about the use of our words. In the third message, Pastor Paul explains how we can have healthy habits and the importance of them. In the second message, Pastor Paul talks about breaking bad habits. 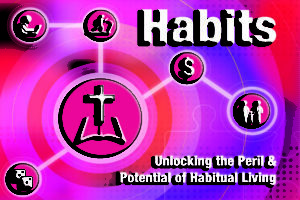 In the first message, Pastor Paul talks about how habits are important.